One notable addition that I discovered in perusing our recent inventory is that we’ve started offering a far wider selection of better gold coins. This is due to a closer association with several dealer friends that we’ve started doing more business with, and it’s also a result of the fact that we see that our customers appreciate the wider array of gold coins. Thankfully it’s not at the expense of “type” coins, as we’re still adding those to our wide variety of offerings, but it has widened our scope of the numismatic world. So, the major question that we’re getting asked around the hobby is “how is your new partner to work with?” I must admit, I had a pretty charmed gig when I worked with John Feigenbaum, so it’s hard to compare. I was able to work for someone I respected and that I now call a closer friend. However, in my (not really new) role at DLRC, I would tell anyone that Mr. Hansen is a delight to work with. From the business side, he offers insights to his world that are quite fascinating, and from the numismatic side, it’s been a fantastic journey to work with his collection. In the end, do the bad deals come? Of course! However, it’s our job to weed through these to protect ourselves and our customers, and it’s still a delight. Every day is different when we come to the office, and it is a pretty sweet gig. We get to handle some of the most amazing coins from our country’s history, and we get to work with many amazing customers. So, thanks for working with us, and we hope that we can continue serving you! Why we love it: A better date S-Mint Standing Liberty Quarter becomes rare and desirable with the Full Head designation. A gorgeously toned gem example with rose and orange colored tints and strong underlying luster. This is truly a perfect coin for the advanced Standing Liberty Quarter collector. There are only 12 examples of this date graded finer by PCGS. Value: The PCGS Price Guide has this coin valued at $25,000 with the CPG Value coming in much higher at $31,500. The CDN wholesale bid is reflected at $26,000 as well. The reserve for the coin in this week’s auction is set reasonably at just $23,000, much lower than even the wholesale value! This is an incredibly fair value for a gem example of a date that is so rarely seen with the Full Head Designation. 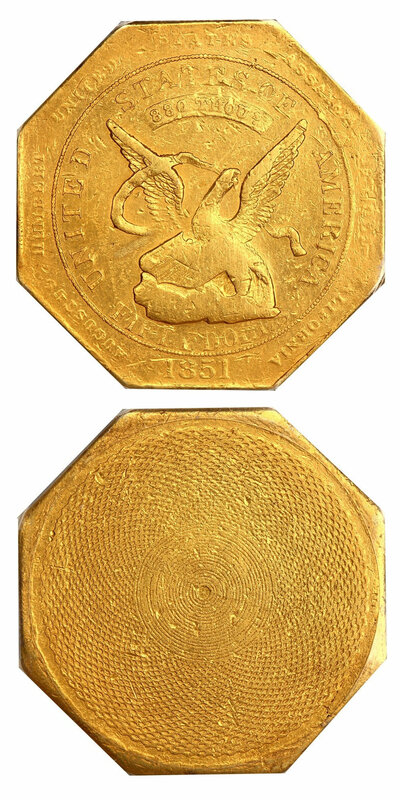 Why we love it: The $50 Humbert, commonly referred to as the “Gold Slug,” is such a scarce and unique issue desired highly across numismatics. These were a reliable currency used in the period of the California Gold Rush, before the United States could produce enough coinage for everyday use. This piece is a nice example of a choice VF grade with flashy yellow surfaces and light, even wear across the coin. The obverse can be viewed as a nice VF, with the reverse a likely XF on its own. Value: The most recent sale of a PCGS graded example in the same grade brought $32,900 at an auction held by Heritage just a few years back. The PCGS Price Guide has it valued a bit higher at $34,000 even, making the reserve amount of just $32,500 in this week’s auction reasonable. This is an extremely fair value for a choice VF example of this rare and popular issue. Why we love it: The 1893-S Morgan Dollar is a famous key date that does more than just transcend its own series as it is so greatly desired by every collector across the entire numismatic spectrum in all grades. This high-end AU example features mostly bright white surfaces with faint toning and barely any signs of wear. That along with excessive amounts of remaining luster make for fantastic eye appeal. Value: The PCGS Price Guide has this coin valued at $42,500 with the CPG Value coming in a good bit higher at $47,200. This bright white, lustrous AU example of this famous key date Morgan Dollar is available for purchase via Make Offer for just $38,500, which is thousands below both price guides. Why we love it: This is a rare opportunity to acquire this scarce Panama-Pacific Round with CAC approval making this example the absolute ideal piece for the AU grade range. The surfaces are nicely original with very light signs of wear giving it high-quality eye appeal for the grade. These seem to be much tougher to come across than the Octagonal of the same issue. Coming from a low mintage of just 483 pieces, this is one of the most popular classic commemoratives that eludes most collectors. Value: The rarity and desirability of this Commemorative issue are unmatched, and the quality of this example is right on par with what you’d expect for the grade and the sticker. 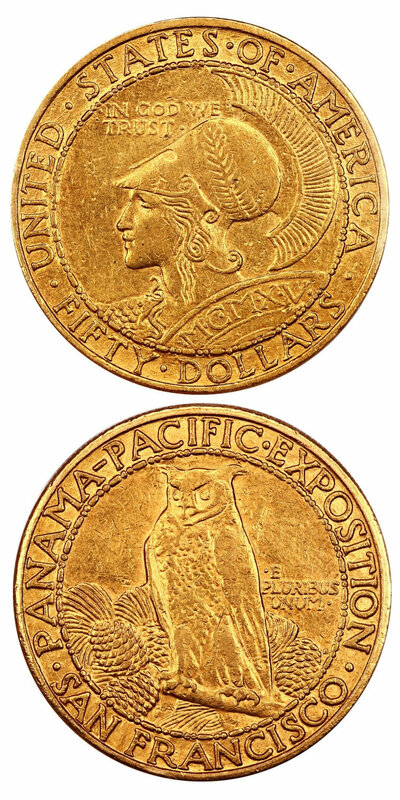 With a reserve in this week’s auction of just $62,500, this is a nice piece for a fair value on what is also one of the most affordable examples of the famous Pan-Pac Round you’ll see. Why we love it: A scarce date Liberty Double Eagle from the popular Carson City Mint that is difficult to find with the coveted CAC sticker. This example is quite unique with attractive reddish tints in the fields, which combined with its limited amounts of even wear make it the ideal AU coin. 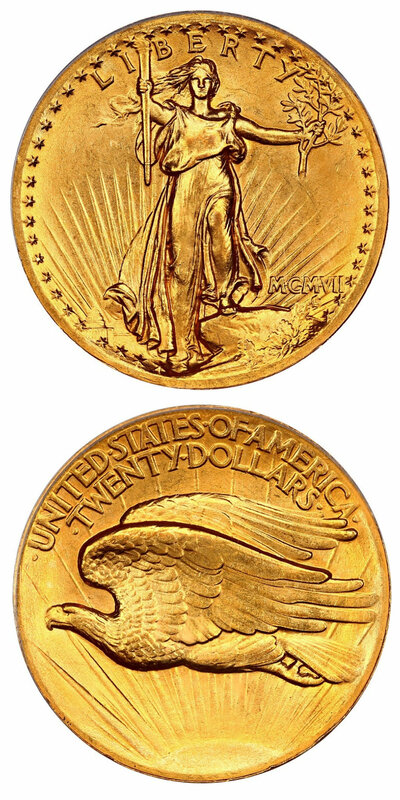 This Liberty Double Eagle issue comes from a low mintage of just 9,450 coins originally struck. Value: The PCGS Price Guide has this coin valued at $21,000. With the scarcity of CAC’d gold coins available on the market, this piece is a nice value as it is available via Make Offer for just $19,000! That is a solid $2,000 under the PCGS Price Guide Value for this CAC approved, attractive AU example of this scarce piece. Why we love it: The High Relief Saint Gaudens is one of the most popular and beautiful designs across all of U.S. Numismatics. This scarce issue comes from a low mintage of only 11,250 coins struck. This near-gem example possesses the eye appeal and overall surface condition of a true, complete gem as it is absolutely pristine with no detracting blemishes. Value: CAC’d examples in this grade typically garner around $30,000 in auctions and on the wholesale market. The PCGS Price Guide even has it valued at $32,500, with the CPG coming in at a wholesale level for a CAC coin at $28,400. Reserved in this week’s auction for $28,000, this would be the cheapest we’ve seen a CAC’d 64 offered in quite some time. Why we love it: An incredible rarity in the proof Seated Half series that rarely comes available on the market. This lovely example displays pristine near-gem proof surfaces that are deeply toned with pretty hues of blue and lavender that create stunning eye appeal making this rare piece even more unique. This Proof Liberty Seated Half Dollar issue comes from a minuscule mintage of only five or six coins originally struck in which just a single piece is graded finer by PCGS. Value: The PCGS Price Guide has this coin valued at $47,500; however, it is available via Make Offer for the far lesser amount of just $41,000. That is an entire $6,500 below the PCGS Price Guide Value for this beautiful, deeply toned near-gem example of this proof Liberty Seated Half Dollar Rarity. 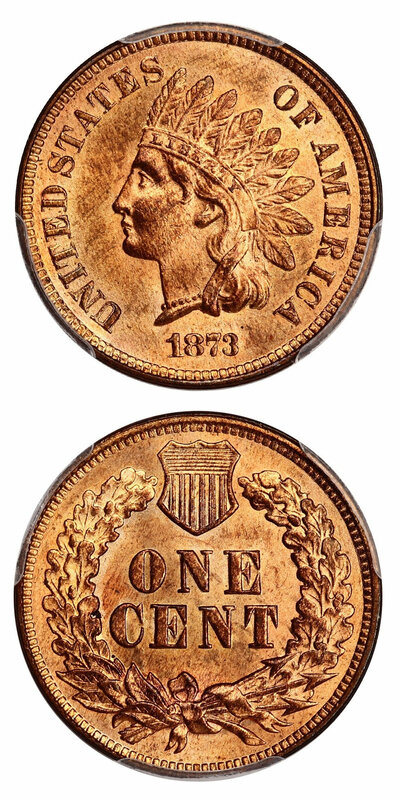 Why we love it: A tough, underrated date in the Indian Cent series that becomes even more difficult to locate in gem condition with full red color. This gem example displays premium red surfaces with pretty pink-orange tints and plenty of gorgeous luster making the eye appeal simply incredible. There are only seven other examples of the Open 3 Variety in existence graded finer by PCGS with the Red Designation. Value: The PCGS Price Guide sits at $5,250, but we are offering this coin via Make Offer for the reasonably low amount of just $4,000. That is a substantial discount of $1,250 off the PCGS Price Guide Value for this red gem example of this scarce Indian Cent issue making this a fantastic opportunity to acquire it at a great price. Why we love it: An affordable near-gem type coin for the Three-Cent Nickel Series. This coin displays lovely pastel toning with light blue and golden highlights complemented beautifully by its incredibly strong luster. These attributes along with its mostly pristine surfaces give this perfect type coin nearly flawless eye appeal. Value: The PCGS Price Guide has this coin valued at $215 even with the CPG Value a little bit higher at $247. This 3-Cent Nickel Type Coin is available for purchase via Make Offer for just $205, which is a decent discount off the PCGS Value of $10 and a more attractive discount off the CPG Value of over $40. Why we love it: A popular New Orleans Mint issue type coin for the Morgan Dollar Series. 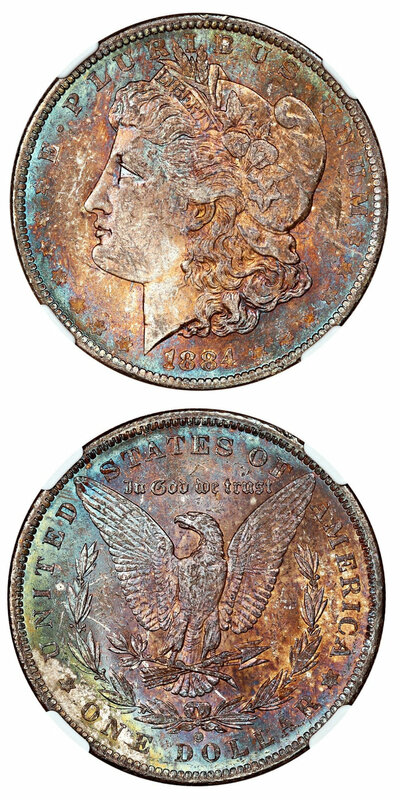 This stunning gem example displays beautiful toning covering both sides of the coin completely. The periphery of the coin features bright blue-green with subtle lavender tones inside of that along with a rich orange-gold center. Value: With a fair best price of just $225 via Make Offer, this is an amazing, affordable opportunity for any Morgan Dollar collector or toning enthusiast to add a gem to their collection that provides such lovely color, which sets it apart from just any 1884-O Morgan. Why we love it: An affordable yet attractive example of this popular key date Indian Cent. All the surfaces are completely original and evenly worn with solid, pretty light brown coloring throughout. 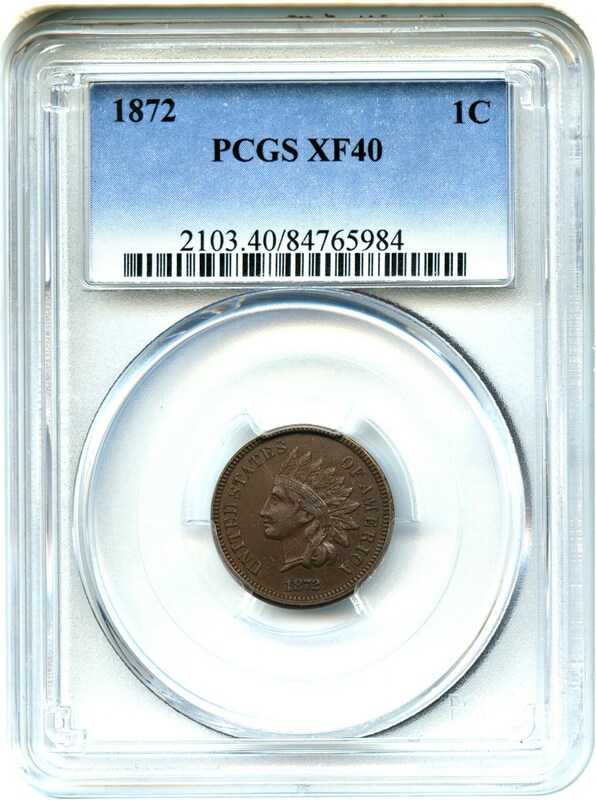 This highly desirable key date offers everything a collector would expect from the ideal XF Indian Cent at a fair price point. Value: The PCGS Price Guide has this coin valued at $500 even with the CPG Value a little bit higher at $566. 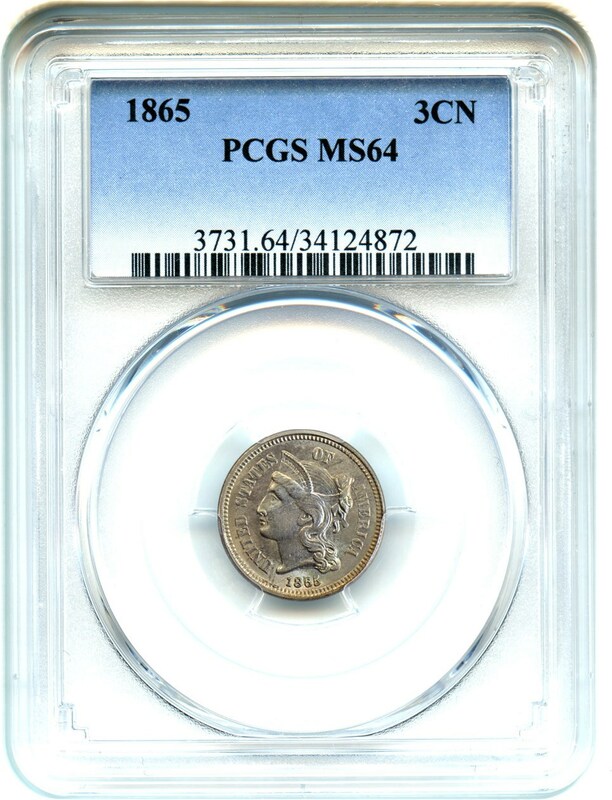 This key date Indian Cent is available for purchase via Make Offer for just $450, which is a fair discount off the PCGS Value of $50 and a more generous discount off the CPG Value of over $100.